Chipping can mean the difference between a low round and a high one. Golfers hate when they hit a good drive and second shot only to find themselves chipping three or four times around the green. Even worse is when the golfer is inflected with yips, where the golfer feels the mechanics of the swing are correct only to have the shot sculled or duffed at the end. But working through the mental aspect of the yips can rid golfers of them forever. Set up in the correct stance for the chip. The ball should be lined up with the back leg and your weight should be mostly on the front leg. 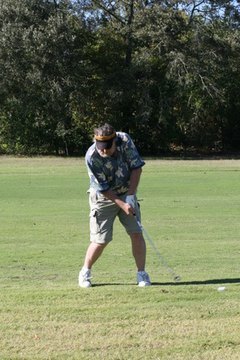 The hands should be forward of the ball with the club angled toward your forward hip. Focus on the mechanics of the shot, as the yips come from worrying about striking the ball properly. Take the club back, think about having a soft, smooth swing and carry that throughout the shot. Bring the club forward and visualize the upper body as a pendulum swinging the club rather than the arms doing the work. Chipping comes from the shoulders. This also keeps the arms straight and tight. The hands should remain in front of the club throughout the downswing. Follow through, keeping the head down to watch the club strike the ball. The swing should feel like you are hitting down on the ball rather than hitting through it or lifting it up. Turn your body through the follow-through so that the club is straight out pointing at the target. Your head should still be facing down until the swing is complete to make sure you did not try to lift the ball during the shot.